Blogger and author David Lebovitz tells us this week about these new chocolate stamps that are being printed by La Poste, the French postal service. Unlike those popular Chinese Year of the Pig stamps (which were touted to taste like sweet and sour pork, but by all accounts...kinda didn't), Lebovitz writes that these stamps really are scented (with the aroma of chocolate). A set of 10 stamps -- which come in a booklet made to resemble a chocolate bar -- is 8.5 € over at La boutique web du timbre. Interested? Why not? 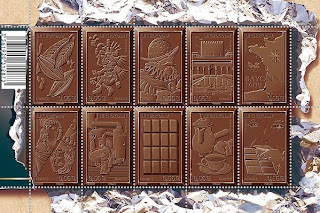 These chocolatey-good stamps can also be purchased online and shipped to the U.S. When people used these stamps on an envelope, I'll bet dogs would love it when the mailman delivers.